I do love those dreamy vacation stops in Donna World. It's such a happy place to hang. Everyone's so nice and they all have that sweet Scottish lilt to their speech that I find so fascinating to listen to. Nerd is the word here; it's a title of deep respect. Dogs and cats get along and play under under the rainbow adorned skies. Delicate laced butterflies flit about flowers that I don't have to remember to water. Ok, shaking that off. I'm back now. In the real world and sitting here looking at Yaxley with less than peaceable kingdom thoughts. I'm working through my noggin that this amazing pup and I have only eight weeks left together. 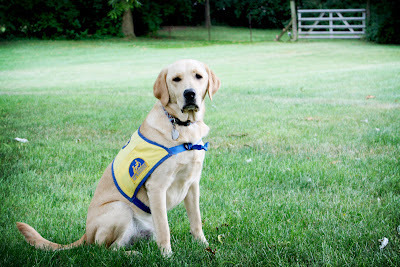 Yaxley returns to Canine Companions for Independence on August 18 to matriculate into the Advanced Training program. We've done a lot, been through a lot, since he bounced into my kitchen in February 2011 as a two month old cotton ball. Our work is just about done. Really, he's pretty solid in most of the thirty commands that CCI asks that we stuff into that gorgeous retriever head of his. So what now? Well, with just two months left, now is a good time to review. Let's see how close to proficiency we can get with these commands. Some we don't need to worry about. Yaxley does an automatic Under/Down when we reach our table in a restaurant. Our little pro will actually do it before I can get the command word out. His eye contact is spot on, giving the impression he's working on a Vulcan mind meld with you. The basics, Sit, Down, Bed, Kennel, Car, Shake, Stand, Drop, Let's Go - all good. We need to get stronger on Back, which is to walk in reverse. A handy behavior for someone who uses a wheelchair and has the dog facing them. A Back command requires that the dog walk backwards while facing their partner. Nice for maneuvering tight spaces where a chair and the dog can't be side by side. Similar is Turn, asking the dog to reverse direction. Then there's our nemesis command of Speak. Darn it, for such a vocal puppy at two months old he just refuses to get this one now. Micron has shown him how to Speak on command. And we use freaky little Jager to demonstrate the Quiet command, which comes out sometimes as please-shut-up-jager. Our little spotted guard dog, alerting us to all imminent danger whether real or imagined. But Yaxley has put up a mental block on this one command. home again, Jager. Duly noted. 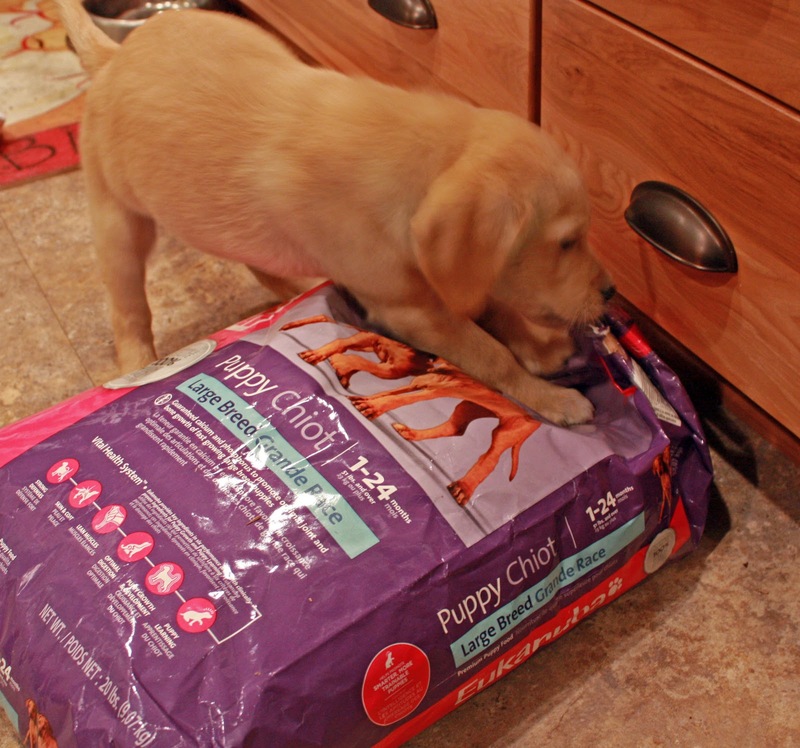 And then there's that one oh so special thing that only volunteer puppy raisers can provide. 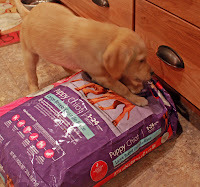 So critical during those young puppy months, this socialization stuff. 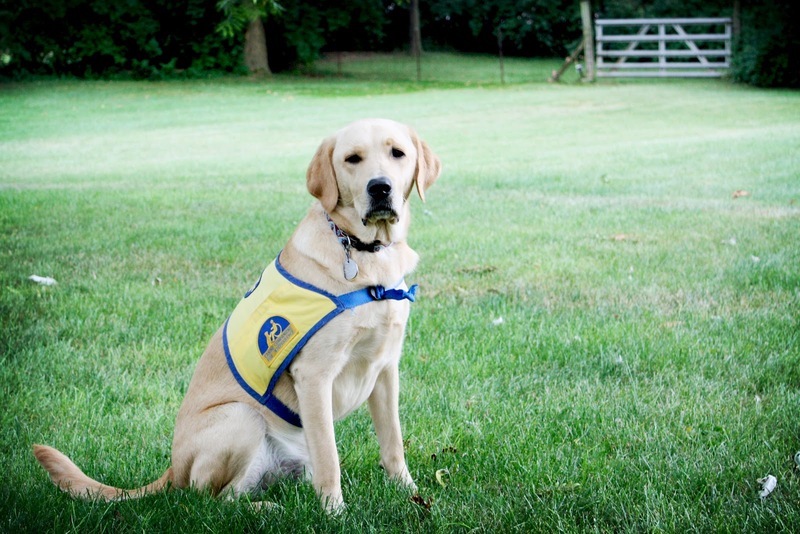 The professional trainers at CCI will be focused on the advanced behaviors that an assistance dog needs to know. By the time the pup reaches them, the fuzzy feller needs to have a comfort level with nouns. You know . . . people, places and things. Nouns. Grammar, not so much. I think they can use double negatives and be ok.
A search through this humble dog blog on the word Yaxley (there's a word cloud in the column on the right) will net you our Great Noun Adventures. Beaches and camping vacations and little kids and wearing bunny ears and shopping malls and movie theatres and obnoxious cats that you can't eat and the library and groceries and . . . Stop!, you cry. You're making me tired. Yeah, I know, right? We've been a couple of busy critters. Not my little boy anymore [sniff]. Almost ready for dog college at CCI. Goodness, what could possibly be left then? I'm thinking proficiency is a good goal. For everything, commands and socialization adventures. But let's set some goals. Y'all will keep me on task, right? Ok, let's keep things simple with eight goals to achieve over eight weeks. 1. More socialization. Yaxley needs to be comfortable with entering any place that a person would want to go. We'll cover our first museum trip in an upcoming post. 2. No more flinching at grocery carts. Enough of this one already, kiddo. Yaxley has never been hit by a grocery cart, but the loud noise when carts bang together makes him jump. He recovers quickly, which is a good sign. We'll get a few more grocery trips in to reinforce this environment as a safe and pleasant one. 3. Hold an Up. Front paws on a surface (desk, wall) is Up. He needs to hold this position until told Off. We can do better here. 4. Perform Back without guidance. We introduce this command using a tight space or against a wall on one side. I'd like the see the yeller feller comfortable with this in an open space. 5. No more Chewbacca channeling. I need the help of co-workers, friends and family on this one. You know who you are. All of you that Yaxley loves so much that he will sing his wookiee love songs for you. While holding no less than three toys in his mouth while he circles your ankles. You know how we measure the depth of his affection by the volume of his greeting? Ok, now I invite you to close your eyes and envision an assistance dog on the job. Is the dog singing, dancing and juggling toys? Right, we're gonna get serious on this one. I'm counting on you. 6. Make sure commands are solid without the mighty Micron's assistance. Sure, Micron knows all this stuff. After all, he went through the same routines plus has three months of advanced training under his collar. I want to spend more one on one time with the Yax Man without the competitive nature of these two influencing things. 7. He will learn to Speak on command. Oh yes, he will. Just once. That's all I ask, sweetums. 8. More socialization.Yeah, it's that important. Well, there ya go. It's in writing. And posted out here in the blogosphere so it must be true, right? We got us some work left to do. Please do wish us luck, won't you? I actually took that butterfly photo yesterday. It seemed to fit right nicely into the topic at hand, so I was glad to have it this morning. 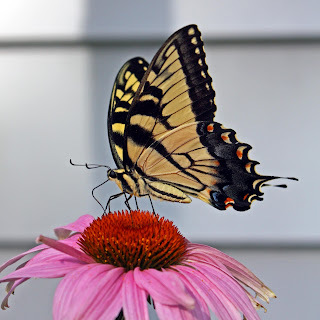 I just looked it up and see that this is a Eastern Tiger Swallowtail Butterfly. Common in Ohio, but rare in the wasted landscape that is my flower garden. By the way, did you know that purple coneflowers don't need much water? I did. What is it about that 'EIGHT WEEKS' mark? That's the one that always jumps out at me, when I'm not really paying attention. Have you tried barking (literally) at Yaxley? I taught Chewy, and now Stinson, to bark by doing just that. At home (or somewhere else equally private) so only the neighbors who live very close think you've actually lost it. Even though I work with "dog people" even barking at Yaxley would probably cause some double-takes. Even serious concern. An excellent idea though and I'll include it in my next plan of attack which will involve high value treats and one-on-one time. Using the other two dogs as examples are only making them fatter with the treat rewards. Despite the fact that We use "dog people" actually woofing from Yaxley could possibly trigger a few double-takes. Actually severe issue. A great concept although as well as I will consist of this during my following strategy associated with assault that will include quality value goodies as well as one-on-one period. While using additional 2 canines because good examples are just producing all of them richer using the deal with benefits.